I’ve had this tool since last Christmas. I received it as a gift from my oldest Son and Daughter-in-Law. I just recently started using it on my Table Saw and Miter Saw for setting angles for various cuts. It have found it to be almost indispensable. I’ve got the Wixey digital angle finder also – but for some reason I like the Starrett better. If you get the change to get one – you won’t go wrong. Also great for doing trim work, if you need to cut a miter, this is the best way to get the correct angle to cut. I know what I’m asking my wife for Xmas! A lot of the reviews on Amazon note the scale is off by as much as one degree. Have you noticed anything like that? I am also curious about the reviews on accuracy I have read. 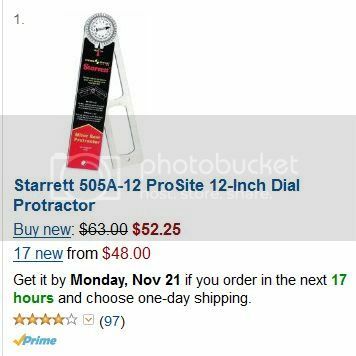 Starrett makes exceptional tools…but 1 degree off will cause problems for precision work. have you referenced its accuracy to any other measurements? Greg, yes, I also have the Wixey Digital Protractor and they both give the same readings. I just cut some 60 deg. blocks to make a tumbling box project. I used the Starett to set the Miter gauge and the cuts were dead on – and with the tumbling blocks they have to be cut very accurately. I wrote a review because that is, exactly, what I found with mine. I finally sold mine and bought another digital, which is far more accurate. What a shame, for want of a decent stick on, which could have been laser engraved.